Arc begins as low-power pre-arc before full-power arc when good contact through workpiece is established. After 5 seconds if good contact is not established, pre-arc shuts off as a safety feature. Pause and start pre-arc again. Tips and electrodes gradually wear out, are consumable. Is currently wired for 240V. Can run on 120V as well, with reduced cutting capacity. Swapping plugs is not sufficient, internal wiring must be changed to become 120V. If wiring is changed, tape a note to the machine informing others such. When running on 120V, after rewiring inside, use the adapter cable made for this. If 120V breaker trips, breaker is 20A breaker on left electrical panel, very bottom left (might change, but look there first if it tripped). Tripped breaker switches are between on and off. Breakers must be turned all the way off before back on. Lower cutting power, lower duty cycle to avoid tripping breaker again. If 240V breaker trips, too much power is being used. At 120V, Cuts max of 3/16" steel continuously. Will cut 1/2" very slowly, 25% duty cycle or the breaker will repeatedly blow. 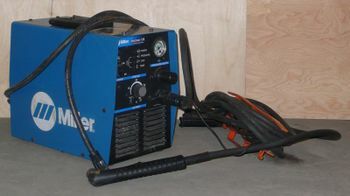 At 240V, Cuts max of 1/2" steel continuously. Will cut 5/8" very slowly. Use duty cycle stated on cutter itself. This page was last modified on 25 November 2016, at 18:03.